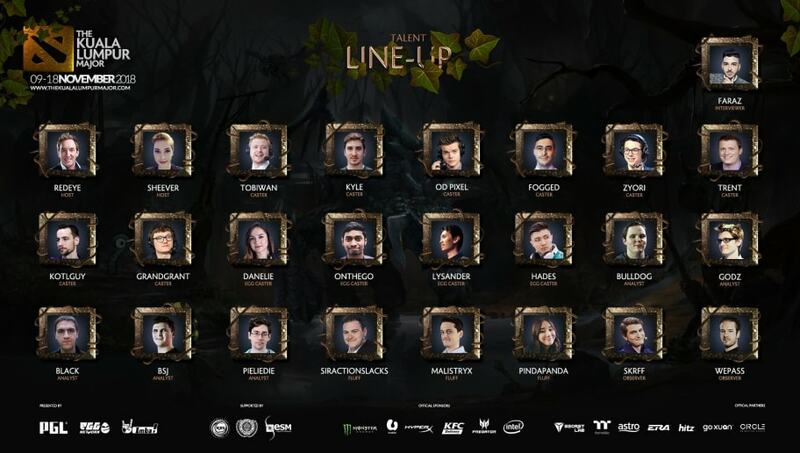 ​PGL revealed the talent lineup Monday for the upcoming Kuala Lumpur Dota 2 Major. As the first ​Dota 2 Major of the year, the Kuala Lumpur will see a huge amount of talent shepherding viewers through the event. Paul "Redeye" Chaloner and Jorien "Sheever" van der Heijden will host the event, with support from interviewer Faraz Shababi. Casters include Toby "TobiWan" Dawson, Kyle Freedman, Owen "ODPixel" Davies, Ioannis "Fogged" Loucas, Andrew "Zyori" Campbell, Trent MacKenzie, Dakota "KotLGuy" Cox and Grant "GrandGrant" Harris. Danelie Purdue, Lysander Xonora, "OnTheGo" Partibhan and Sean "Hades" Goh will be on the EGG cast. In-depth analysis will be performed by Henrik "AdmiralBulldog" Ahnberg, Brian "BananaSlamJamma" Canavan, Dominik "Black^" Reitmeier, David "Godz" Parker and Johan "pieliedie" Åström. Finally, Jake "SirActionSlacks" Kanner, Pinda "PindaPanda" Rika Dorji and Lawrence "Malistryx" Phillips will provide fluff while Johan "Weppas" Westberg and Rikard "Skrff" Holm Melin observe the action. PGL ​announced the Kuala Lumpur Major Sept. 5. The tournament is scheduled to run Nov. 9-18, and will feature 16 teams, including ​Evil Geniuses, ​PaiN Gaming, ​TNC Predator, Fnatic and more.